For some reason, the previous owner of my springer decided to paint the entire thing with tan spray paint. 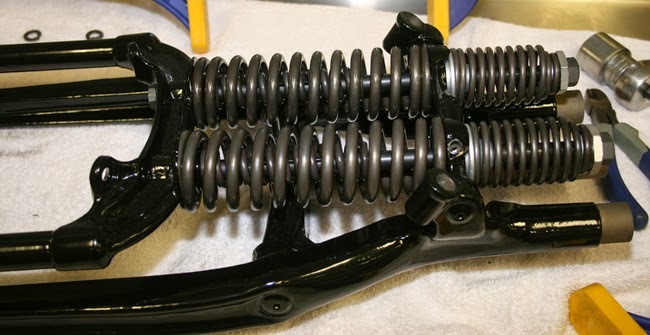 Springs, fork legs, rockers, alemite fittings and even the inside bearings surfaces all got a good coat of paint. I wanted to return the front end to a more correct look, which meant that the springs needed to be parkerized and the rest of the parts needed a coating of black enamel. 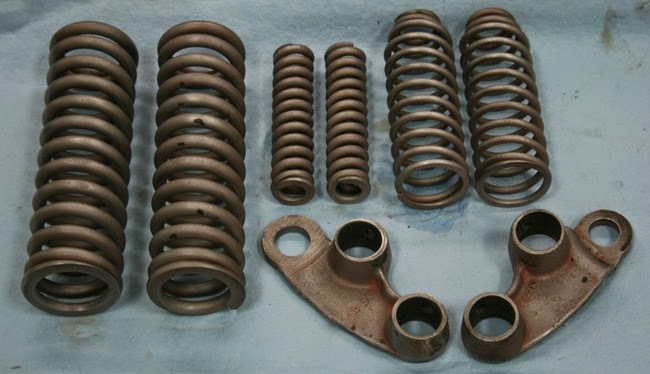 I'm not much of a painter, so I decided to send out the black parts for powder coating while I tackled the springs. The great thing about spray paint is that with a little lacquer thinner and a scotch-pad you can remove it fairly easily. 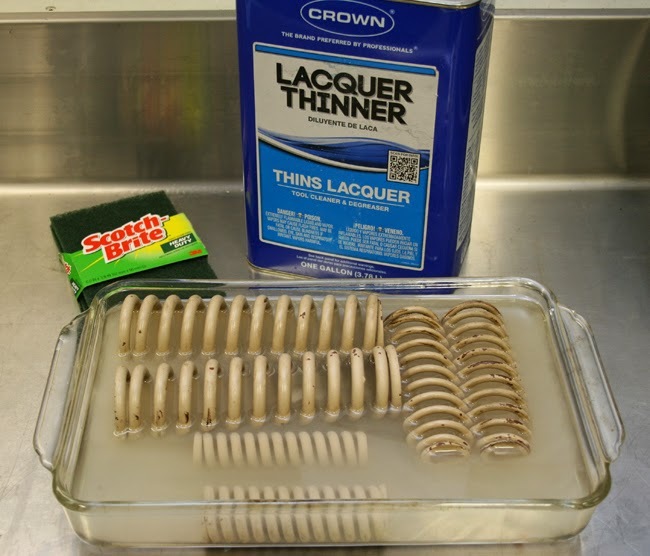 I filled a glass container with lacquer thinner and just let the parts soak for ten to fifteen minutes before scrubbing them with the scotch-brite pad. You'll want to make sure you where gloves during the entire process. Here's how the parts looked after scrubbing. There was still some primer and some older black paint in spots, so everything went in the blasting cabinet for a final cleaning. In the meantime, my other parts came back from being powder coated. 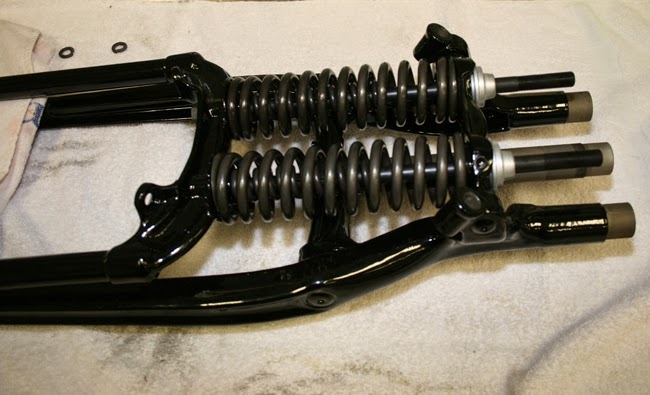 Before I started reassembling the front end, I replaced my spring rods using new rods from Colony Machine. Installation was very straightforward, you simply insert the rods through the tapered holes on the spring fork and then tighten them into place using the supplied hex nuts. My original hex nuts had been welded to keep them from loosening, so figured it would be a good idea to Loctite the new hex nuts to make sure they didn't loosen up on the road. 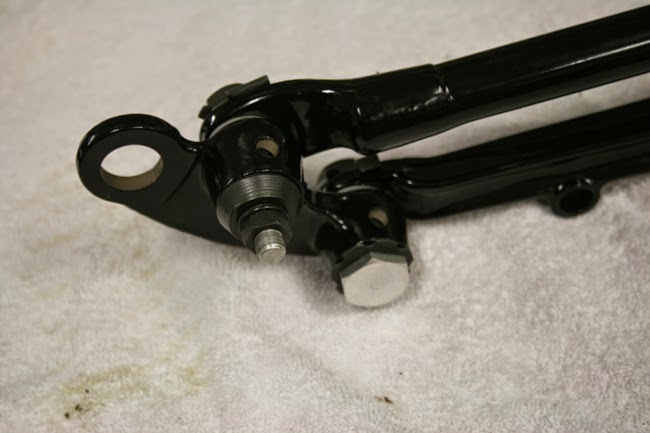 Once the spring rods were in place, I slid the buffer springs down onto the spring rods. They are held in place with flat check springs which fit into a flat section milled into the spring rod. Next came the largest springs, known as cushion springs. 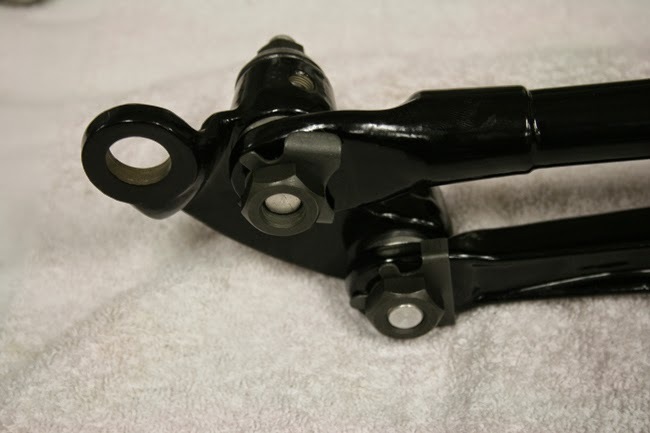 These slide down the spring rods and over the buffer springs. Now the entire spring fork can be installed on the the rigid fork. I covered the rigid fork legs with a towel to make sure that I didn't damage the finish during assembly. After slipping the spring rod bushings onto the spring rods it was time for the hard part, compressing the springs. This step can be potentially dangerous since the cushion springs are very strong and need to be compressed a good deal to finish the installation. Often a large clamp is used to compress the springs, but if something goes wrong, parts can end up flying around your shop. I came up with a slightly different installation method which was quite a bit safer and didn't require any heavy duty clamps. Instead of compressing the larger cushion springs, I compressed the upper fork springs. First I inserted zip-ties into the spring on both sides so that they could be tightened on the middle coils of the spring. 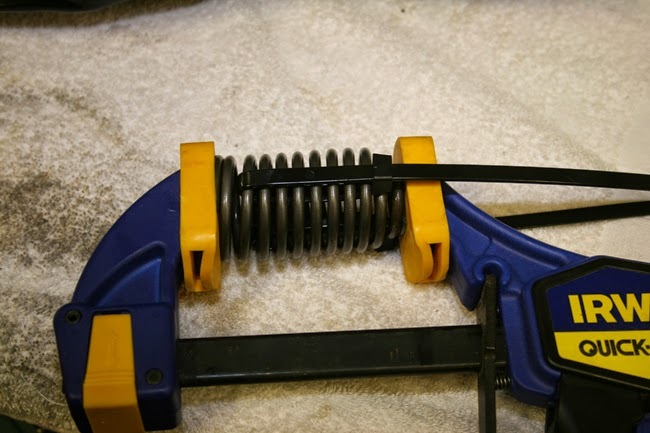 Then I compressed the spring using a Quick-Grip hand clamp. While the spring was compressed, I tightened both zip-ties, making sure they were spaced equally on both sides of the spring. 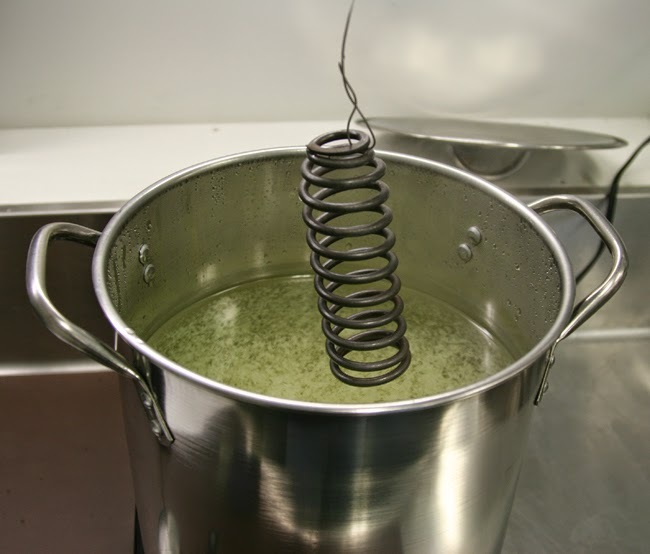 Once the zip-ties had been tightened, the clamp was released and the springs slid onto the spring rods. 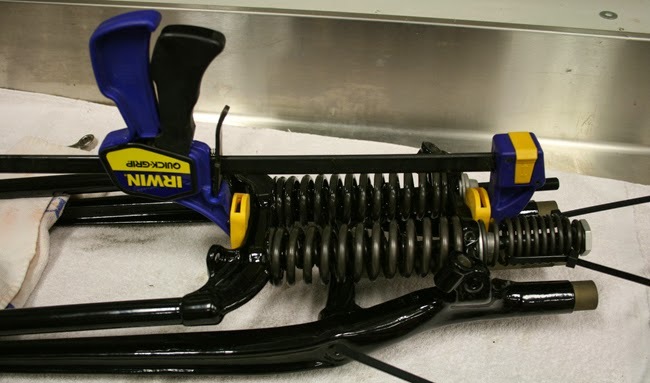 I also used another Quick-Grip hand clamp to keep the cushion springs lined up correctly while I was putting on the spring rod upper end nuts. 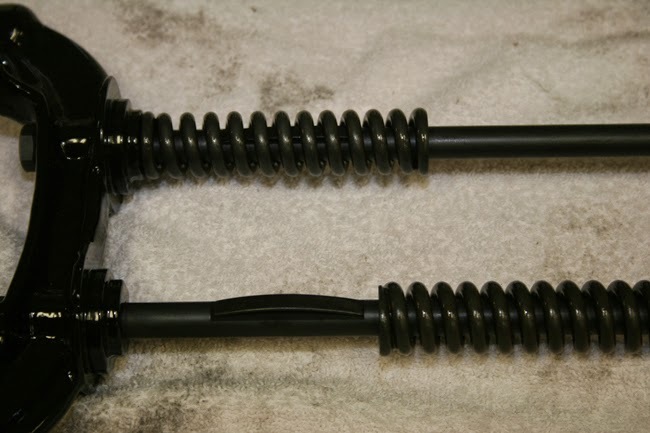 Once the upper spring rod nuts had been threaded onto the spring rods, I removed the zip-ties from the upper fork springs and released the Quick-Grip. The final step to complete the spring installation was to add the upper spring rod lock nuts. Using the tool, I pressed out the old worn bearings and pressed in new replacement bearings from Colony Machine. I then reassembled the rocker plates using the following layout. 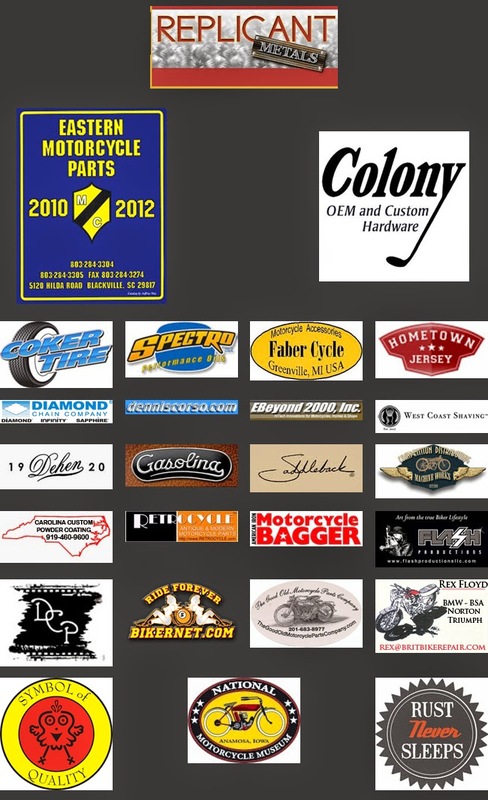 Note that the rocker plate with the offset goes on the right hand side of the motorcycle. Here's what the rocker plates look like on the outside of the fork. Here's what they look like on the inside of the fork. Last step was to install new alemite fittings and to bend in the tabs on the nut locks. 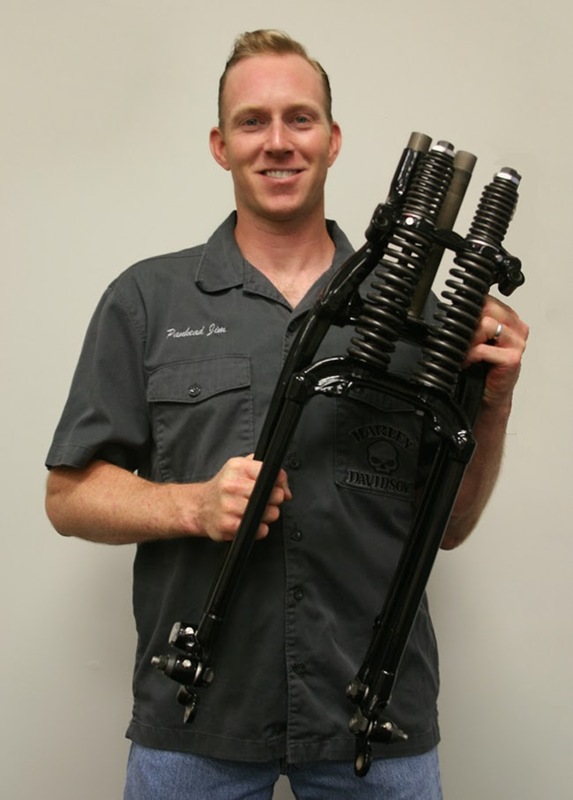 That completed the front end rebuild and it was ready to be installed on the frame.